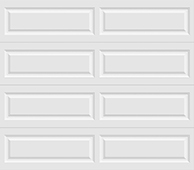 Classic short or long panel steel garage doors. 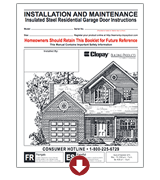 Clopay’s CLASSIC™ collection - Premium Series provides the traditional raised-panel style garage door in a wide range of construction and design options, allowing you to take the time-tested, classic garage door look and make it your own. 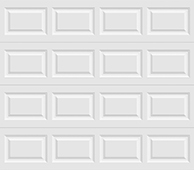 To see an accurate image for uncommon garage door sizes, use our online QuickDraw tool. Short, long and flush panel steel garage doors. Durable steel garage doors available in 3-layer construction. Insulation options include 2" or 1-3/8" Intellicore® polyurethane, 2" or 1-3/8" polystyrene insulation available. Insulated door R-values from 6.3 to 18.4. The steel skins are protected by the use of a tough, layered coating system, which includes a hot-dipped galvanized layer and baked-on primer and top coat. Available in short and long raised panel design options. The three-layer Premium doors have a defined Elegant raised panel design. 14 factory finish paint colors available, including Standard White, Mocha Brown, Ultra-Grain® Classic Cherry Finish and more. A wide variety of window options are available, including decorative, architectural, and double-top window sections. Multiple glass options available including acrylic, insulated, frosted, seeded, rain and obscure. Window grilles are removable for easy cleaning. Learn more about CLASSIC™ collection design. **Available only on 2" thick 3-Layer doors only. ***Sunset Windows not available on Ultra-Grain® doors. Thermal break separates the interior from the exterior skin to improve energy efficiency and comfort. Steel skins are protected through a tough, layered coating system, including a hot-dipped galvanized layer, a protective metal oxide pretreatment, and a baked-on primer and top coat. 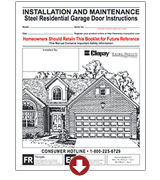 Garage doors featuring Intellicore® insulation technology represent the ultimate smart choice for homeowners. Clopay’s Intellicore® is a proprietary polyurethane foam that is injected into a garage door, expanding to fill the entire structure. The result is a door with incredible strength, energy efficiency, and durability.